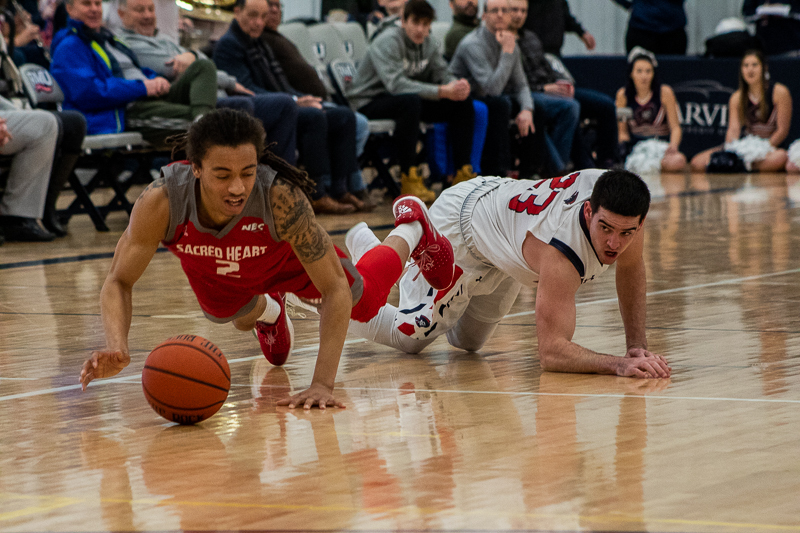 MOON TOWNSHIP -- Matty McConnell pounces on a loose ball against Sacred Heart (Sam Anthony/RMU Sentry Media). MOON TOWNSHIP — On a chilly January 31 at the North Athletic Complex, against the Saint Francis Red Flash, Matty McConnell of the RMU men’s basketball team did something only 24 others have done before: Score 1000 points as a Colonial. McConnell scored his 1000th point when he hit the first of two free throws at the 10:47 mark of the second half. RMU Sentry Media had the chance to go to practice on Monday to see what both McConnell and head coach Andy Toole thought of the occasion. On the year so far McConnell, who is averaging exactly 10 points per game, leads the team with 41 steals and 70 assists on the year. In his four year career as a Colonial, he has 1015 points, 216 steals and has started 108 out of 119 games played. He has averaged 8.9 points per game in his career. As the only senior on the team, McConnell has seen a turnover of players on the roster and said, “it’s been tough but fun” in regards to having new teammates every year, working with them and building chemistry. The Colonials next home game is Thursday against the Bryant Bulldogs. Tipoff will be at 7:00 p.m.